Team Scordo is a husband and wife Real Estate Team which provides Residential and Commercial Real Estate support to buyers and sellers in Northeast Florida. 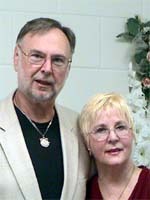 The team members are Alice and Charlie Scordo and they have worked with Buyers and Sellers as far away as Japan, California, Minnesota, Nevada, and Georgia. The combination of the computer and the internet, joined with the ability to secure electronic signatures, has had a profound impact on the Real Estate Industry in Florida. Team Scordo has intimate knowledge of all facets of Residential Real Estate, having sold numerous single family residences, mobile home and land sales and purchases, mobile home purchases with separate land purchases, HUD Repossession properties, REO Purchases, Short Sales, Fannie Mae Repossessions, Auction Properties, and vacant land, to just mention a few. Alice Scordo began her Real Estate Career here in Northeast Florida in 1975 when she received her Florida Real Estate License and became a sales associate with Mac Heavener, of Heavener Realty fame. Since those early days she has also worked for Century21, and Coldwell Banker Realties. Alice has also worked for several Builders to include Zuckerman Homes in West Palm Beach, and Adams Homes here in Middleburg. Alice has gone on to earn her Broker’s License and is now associated with C B Isaac Realty as a Broker Associate. Charlie Scordo was graduated from Jacksonville University in 1969. He also spent three years in the US Army, serving during the Viet Nam era. After attending Jacksonville University Charlie worked for the Federal Aviation Administration, Air Traffic Control Division, and he retired with 27 years of service. After retirement Charlie became a Florida Licensed Mortgage Broker and ultimately started his own Licensed Mortgage Brokerage Business in Jacksonville. After selling the business, Charlie worked for the Florida Department of Revenue as a Child Support Auditor and in the Judicial Filing Department; he also spent some time working in the Jacksonville Housing Authority in the Section 8 Program Department. He is now using his Real Estate Sales License as a Sales Associate with C B Isaac Realty.